The new dazzling effect light from the ego series shoots colorful, piercing images into the night with DMX controlled simplicity. Incredible lighting effects are enhanced by a textured glass wheel which adds depth and life to each gobo pattern while razor sharp optics produce brilliant midair effects. 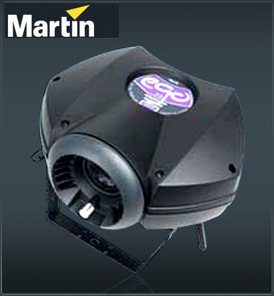 The Martin ego x6 comes with 12 inbuilt macros to get you shinning fast at any show or venue. A powerful 250-watt, 1000-hour halogen lamp combined with a bidirectional parabolic reflector, (with highly reflective mirrors), gives exceptionally bright projection. A convenient handle and lens protection ring makes for easy transport and handling, and a switch mode power supply makes set up even more straightforward, meaning you can take your ego around the world. A special ego carrying bag is also available which will hold two fixtures.